1. Holy creative comic capers! Your kids could become comic crusaders, making and playing with their own ‘comic dice’ during the April school holidays. Costumes are welcomed! These free events are perfect for 6-10 year olds, and bookings aren’t required. 2. 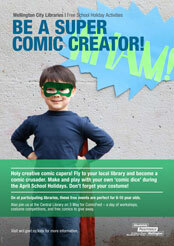 Join us at the Central Library on 3rd of May for ComicFest and celebrate International Free Comic Book Day – a day of workshops, costume competitions, and free comics to give away for all ages! Wellington Children’s Community Choir, featuring 5-12 year old choristers, will be putting on a special performance for all. Come along and watch, listen and participate. 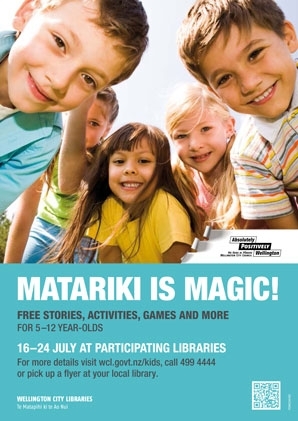 Matariki Magic: Celebrate the close of Matariki, our Aotearoa New Year, with a free school holiday activity session at Central Library. Explore our myths and legends with a fun Matariki badge-making craft activity afterwards. Multicultural Matariki: Take a mythical voyage with us and find out what Matariki means to people around the world. Make your own Matariki star or kite to fly. What’s on these school holidays! 10.30 am, Johnsonville Library: Join us for an interactive story-time where we read and act out ‘Down the Back of the Chair’ by Margaret Mahy. Take part in other ‘Kiwiana’ activities during this fun-filled hour. 11 am, Central Library: Wellington author and illustrator duo, Lucas and Jutta Chisholm will show off their latest creation and teach you how to draw and create your own character from the book. Prepare for hands-on fun with books, drawing and plasticine! 10.30 am, Ruth Gotlieb (Kilbirnie) Library: Slip on your jandals and join us for holiday fun at the library to celebrate Kiwiana! We will be reading stories by New Zealand authors, playing New Zealand bingo, and holding a rock-stacking competition called Tu Kohatu. Sweet as! 11 am, Karori Library: Special Kiwiana story time. Come along for fun stories with a New Zealand twist. 10.30 am, Newtown Library: Slip on your jandals and join us for holiday fun at Newtown Library to celebrate Kiwiana. We will be reading stories by New Zealand authors, playing New Zealand bingo, and holding a rock-stacking competition called Tu Kohatu. 11 am, Central Library: What do ANZAC biscuits have to do with ANZAC day? What’s it like being a soldier away from home, missing your family, friends and favourite food? Explore the great ANZAC biscuit and its place in history. Over the school holidays we’ll be celebrating the 200th anniversary of the Brothers Grimm and the 150th anniversary of Alice’s Adventures in Wonderland with stories and activities at participating libraries. You can find a full schedule of activities on at our libraries on our Kids’ What’s On page — come along for Wonderland croquet, special themed storytimes, scary Halloween stories, dressing up, and more! 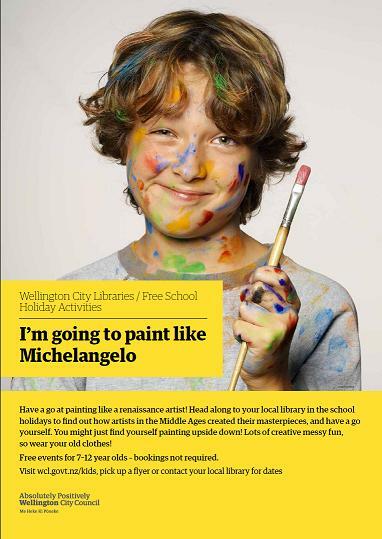 These free fun activities are suitable for 5-12 year olds, and no bookings are required. We’re going nutty about the Olympics and have something very cool and unusual for you to try out at your library during the July school holidays. We are very lucky to have paralympians visiting to tell us all about their experiences and to show you how to use some of their special sporting equipment. Try out a rugby wheelchair, learn how to play Boccia and Goal Ball and more! We also have sporting story sessions and Olympics quizzes – see how much you know about the Olympics! Paralymics – Come to the library to meet a Paralympian and try out their special sporting equipment. Olympics holiday quiz – earn your place on the finishers’ podium! All sessions are free and suitable for 5-12 year olds. Don’t miss out -see you there! 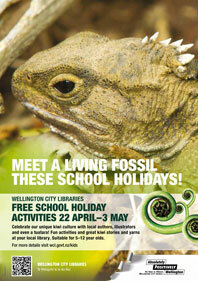 There are loads of activities in our libraries these school holidays, starting Wednesday 11 April. 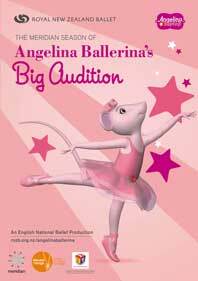 Will it be Sink or Swim or Angelina Ballerina? Sink or Swim? Find out by taking part in our fun stories and activities to mark the 100th anniversary of the sinking of the Titanic!